I'm now 6 months pregnant and I'm starting to prepare for the babies arrival because she will be here before we know it. On a whole I'm not usually an organised type of person but when it comes to my children and pregnancy I like to have everything planned out and ready. 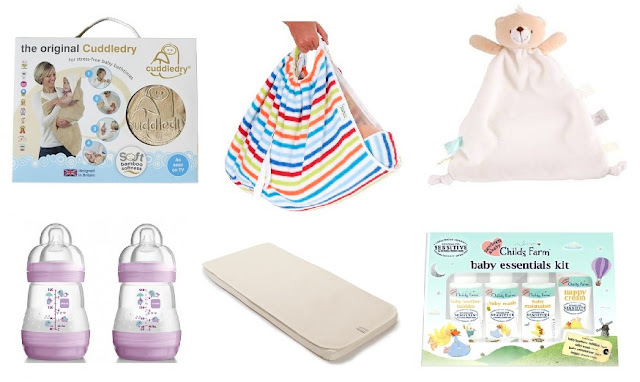 With this in mind today I thought I'd put together a post all about my baby buy essentials which will include items which we already have and items that we are still to buy. I think bathing a newborn is one of the most daunting things to do when you're a parent so when genius products like the Cuddledry apron come along you know you've just got to have it. You simply wear it like an apron when bathing your baby which allows you to keep your hands free whilst doing so. It's made from the cotton and bamboo fibre which doesn't just make is soft but super absorbant too. This is a product I wish I'd of had when Noah was a baby so I'm really excited to be able to try it out this time around. The Snugglebundl is said to be the only baby blanket which makes parenting easy. There are many ways in which you can use it but my favourite has to be for travelling as it's completely safe to use when in a car seat. Noah has had a comforter since he was a newborn baby and he still uses it now almost three years later. I was recently sent the My First Forever Friends Snuggle Blankie for the baby which hopefully she will take a shining too. It's absolutely adorable and made from the softest of material. I'm not sure how we will be feeding the baby just yet so I've bought and received samples to cover me across the board. I have bottles, breast pumps, sterilisers, everything all ready. Amongst the array of different baby bottles I've put aside the MAM bottles as they were perfect for Noah and I just have a feeling that the baby may take to these ones too. The Little Green Sheep specialise in organic mattresses and bedding and are quite well known within the parenting and blogger community. I was recently offered the change to review one of their organic mattresses once the baby has arrived and I'm so pleased about it because one was on by to buy list. Childs Farm are a brand we've been using for some time now and at a recent baby show I attended I was told their products are safe to use on baby from day one. With Noah we bathed him for the first time at 7 days old after his cord fell off and used the tiniest drop of product so I think we will be doing the same this time around too. It's great to know that Childs Farm products are gentle enough for me to be able to do this. This is another product that I used back when Noah was a baby and it was one of my favourite items ever, it's a must have for me. A Nod Pod is a baby blanket with legs and just makes our lives so much easier as parents. I've recently been sent a baby pink one to use when the baby arrives and I'm so looking forward to using one again with her. I can't recommend them enough. Although the baby will have a lot of hand me down toys and teddies from her big brother I have been setting aside news ones that are just for her. The interactive Guess How Much I Love You Hare is an interactive toy which plays peekaboo and giggles. It's absolutely adorable and I'm sure the baby will adore it. 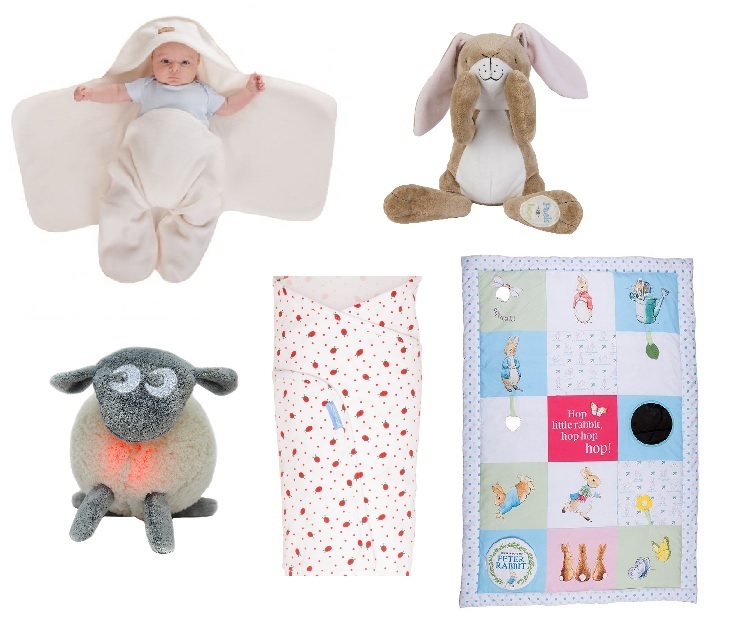 Another of my baby essentials has got to be Ewan the Dream Sheep. I actually didn't have one for Noah when he was a baby but ended up buying one when he was about to turn two believe it or not! He was going through a rough time with his sleep and as I already knew that he was fond of lullabies and white noise I bought one. He's now almost three and still uses it! A genius baby product and another that I can't wait to use with out baby girl. The Gro Company are one of my favourite baby brands as we swore by their Gro bags through out infancy and through to toddler hood with out son. They made Noah sleep so much more soundly and safely too and we will be reusing them this time around. I was recently sent one of their swaddles to try with the baby once she's born and I hope that it helps to make her feel warm and secure. We will hopefully be using swaddles until she is old enough to start using the sleeping bags just like her brother did. Last but not least we have the Peter Rabbit Playmat. This is beautiful, gender neutral and features the beloved Peter Rabbit characters. It's designed to encourage babies earlier development skills and has many different actives to stimulate their senses. 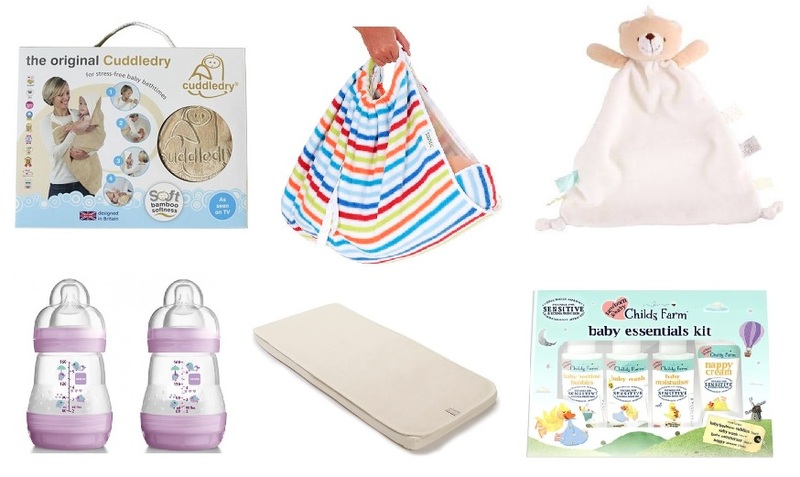 What are your baby buy essentials? * These items have been sent for the purpose of this post or to review in the future. However all opinions are my own. I've just ordered myself some Gro Swaddles!! They just look so cosy...I wish they did adult versions haha! The Cuddle Dry is so handy. I love mine! There are some fantastic ideas here, thank you! We are in the process of buying everything we need for our new little bundle. I think Gro-Bags are essential and I adore the Peter Rabbit Playmat. My best friend is pregnant so these are some great tips for present ideas! Great ideas. Often lots of baby items are received as gift/s. I tend to try to ensure that I look at tethers and weaning items. As baby seems to grow up so quickly. Teething can go smoothly, but not always, and I don't like to think of baby being in pain. Also weaning, keen for the process to be positive and practical :- so I look out new items and consider them for practicality etc. I love the snugglebundl. Some great ideas here! Yeah , all are very essential for my baby. I am missing Childs Farm Baby Essentials Kit so much! Childs Farm Baby Essentials Kit very essential! Check out the best baby monitors reviews. Thanks!